After what seemed like forever without anything new, this week has sure given us plenty to talk about, and today is no exception. 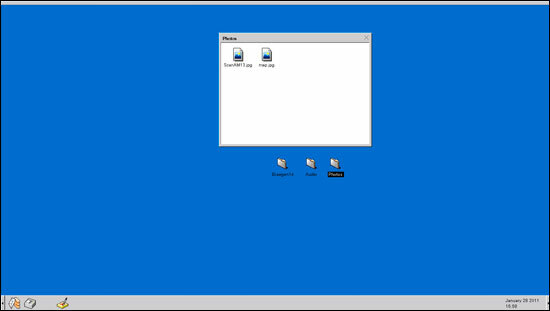 A map has just appeared under the Photos folder on the desktop over at STIES. Thanks Armondo for pointing it out in the comments. 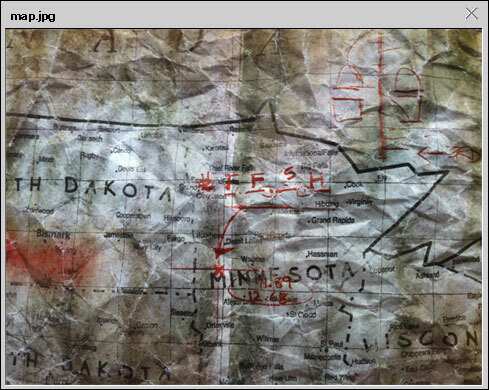 The map above shows us a location in Minnesota that obviously holds some importance. The location indicated by the red arrow appears South of Detroit Lakes and a little South East of Fargo, ND. There is also a set of numbers circled, 19.89 (might be 11.89) and 12.68 (as far as I can tell). I thought they might be latitude/longitude lines, but they seem to lead me way out of the US... There's also what appears to be "#FFSH" near the top of the map with some lines and circles underneath as well as a cryptic drawing in the upper right that I can't make any sense of. Update: Looks like some of you have figured out that the FFSH could stand for Fergus Falls State Hospital, which would fit in where the X on the map is. Nice one! Here's another look at the map with the reds a bit more saturated so you can see them. That's all I've got so far, after the jump I've included a google map screenshot of the same general area, but the map above is too spread out for me to determine the exact location of the X.
Update: And of course you guys come through when I couldn't. It appears as though the X may be Fergus Falls, MN. It also appears that in the upper right corner, near the drawing, is "3RD" next to the arrow. Let me know what you guys find! 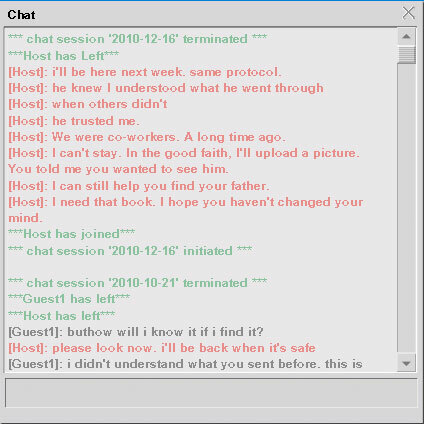 Update: Thanks Knut for the email and Jason for the comment with this information. 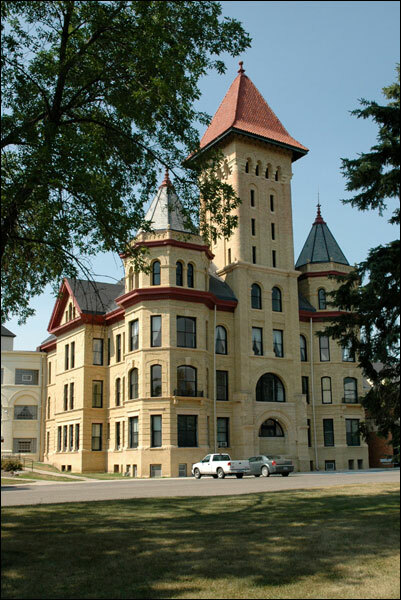 It appears as though we're on to something with the FFSH being the Fergus Falls State Hospital. Check out the images below, the first is just the outside of the hospital, which is abandoned, but that's not really the interesting part. 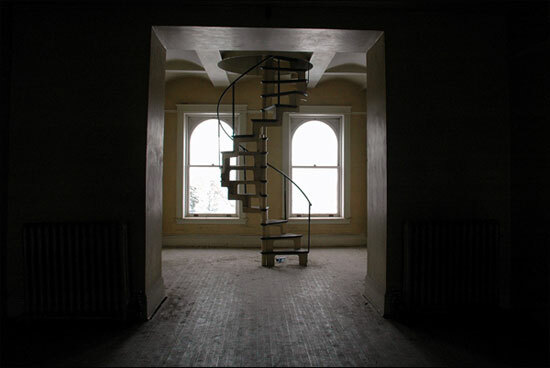 The 2nd image shows the inside of the hospital and a spiral staircase surrounded by two windows... does it look familiar? No? Look back at the map image above, look at the red scribble in the upper right... it's a spiral staircase with 2 windows! So I'm thinking either there's something on the 3rd floor of the hospital, which is where this picture was taken, or maybe whatever was in the canister that Josh can't find (energy source) is hidden in the 3rd step of the staircase... either way it's definitely interesting and hard to deny that this is exactly what is depicted at the top of the map. Check out more images of the interior of the abandoned Fergus Falls State Hospital here. The account associated with those pictures is definitely not part of the viral as it was created awhile ago and the user has over 2000 posts already... plus the post with these pictures was made a couple years ago.